The inshore lifeboat launched on August 5 at 12.10pm to assist with a medical emergency within the harbour. After stabilising the casualty, with the assistance other medical professionals, the casualty was transferred to a waiting ambulance and transported to a waiting air ambulance. Then on August 13 just before 8pm the lifeboat was put back into action to reports of a vessel unable to start its engine in Starehole Bay, and close into the rocks. 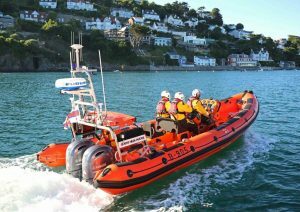 The lifeboat located the casualty, started the vessels engine and escorted the casualty back to its mooring in Salcombe Harbour. It’s also been an extremely busy time for the all-weather lifeboat. 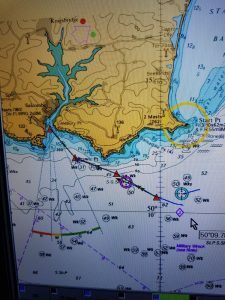 On August 3 the lifeboat was paged at 2.20pm to search for an overdue fishing boat whose last known location was some 15 miles south of Salcombe. The vessel was eventually located near to the coast of Guernsey. On August 4 at 4.15pm the crew launched to locate a 24ft powerboat three miles south of Start Point. Once located, the casualty was towed back to Salcombe. On August 9, the all-weather lifeboat launched at 3.50pm to a 33ft fishing vessel with engine failure two miles south of Prawle Point with two people on board. Upon arrival a tow was established, and the vessel brought back to Salcombe. Less than 24 hours later at 2.10pm on August 10 it was launched again to a 28ft powerboat with engine failure just south of the Gregory rocks, the vessel was located, and a tow established, and brought back to Salcombe. Then the following day on August 12 at 4.15pm the lifeboat was tasked to locate a small dinghy reported to be drifting with no occupant 12 miles south east of Start Poin. The vessel was not located after a lengthy search in conjunction with Coastguard helicopter. The lifeboat was stood down and returned to Salcombe. On August 13 at 7.30am the lifeboat launched to locate a 16ft boat with no occupant south of Start Point. The vessel was located, and a short search commenced, then the volunteers were finally stood down by the Coastguard.